The tawdry, but intimate cabaret setting for this show, with its low lighting, dancehall glitter balls, retro dresses suspended at various levels, ruby slipper coloured trapeze swing, round wooden chair and table, wine at the ready on top is entirely appropriate for the song selections being performed by the inimitable Camille O’Sullivan, an Irish/French singer known for singing her heart out, while hangin’ loose with the boys in the band. The fact that the majority of Ms. Sullivan’s numbers were written by distinctively non-conformist male singer/songwriters: Jacques Brel, Nick Cave, Tom Waits, David Bowie, with lone numbers by Bob Dylan and Trent Reznor (Nine Inch Nails) is another Sullivan hallmark, as is her inclusion of two songs by similarly non pigeon hole-able female singer song-writers, Dilly Keane and the late Kirsty McColl. There is also funny but intelligent humour here, with O’Sullivan, in the guise of a cheery, good sport, 1940’s pin-up, facetiously mugging at members of the audience after each and every pseudo-coy, ‘girlie’ mannerism, as though she was giving her audience credit for synching with her obvious belief that such carryingsm if taken seriously, on are a load of hogwash. As we made our way to our seats, a vintage (1950’s) Hollywood movie circus soundtrack was rolling, its ringmaster telling us to ‘step right up,’ seemingly into another world, that of ‘The Greatest Show on Earth, creating a sense of high anticipation. Although I’ve seen a lot of female singers in my time, among them some of the late greats such as Sarah Vaughn and Ella Fitzgerald, and in recent years, West End diva Maria Friedman, each of whom I greatly admire for varying reasons, I can never recall seeing, or hearing a more dramatic opener than the one O’Sullivan delivers here, which seems to epitomise the show’s title, The Dark Angel. Raven hair pinned back, shoulders draped in midnight lace on a black gown, the songstress made her way down the centre aisle of the theatre to the stage, standing below a dim spotlight, the atmospheric setting bathed in flickering candlelight as her band played the into of ‘My Death’ by Jacques Brel. If it seemed as though Brel’s song was nearly a part of her, it may have been because O’Sullivan’s parents revelled in Brel’s semi-autobiographical repertoire, meaning she had no doubt, grown up with not only a deep respect for Brel’s work, but also an affinity for it. The latter was quite evident by the end of the show, after we’d heard her passionately emote her way through Brel’s: ‘The Bulls’, ‘Amsterdam’, and an absolutely thrilling, definitive version of ‘Marieke’, sans accompaniment, during which O’Sullivan seemed to morph, both vocally, as she began to sing in French, and physically, as her persona evolved from cheeky Irish song-bird to definitive French chanteuse. It was apparent from the way O’Sullivan performed her final Brel number, with glistening eyes and the full power of her voice rising with the song, that she was recalling childhood renderings of ‘Marieke’ while she sang, making it a double-privilege to be in her presence as she performed it. After her very dramatic and compelling opening, O’Sullivan unexpectedly eased into Brel’s ‘The Bulls’, wishing those who had not seen her before a tongue in cheek, ‘Good Luck’, promising the rest of us, ‘as affectionate an assault as possible’, speaking of her ‘love of songs with stories and characters in them,’ elements she certainly excels at conveying via her alternately raspy, raucous, playful, breath-taking, ever expressive voice. The sudden mood change of Bowie’s ‘Rock n Roll’ Suicide, with O’Sullivan pleading with her audience through its words, was just what was needed to keep listeners guessing. However, the beautiful Waits song, ‘All the World is Green’, which O’Sullivan performed from the trapeze, wrapped in a vintage, silver screen era gown, was one of the show’s highlights, as was her later performance of Waits, ‘Misery is the River of the World’ performed as a tribute, mimicking Waits’ rough-hewn voice and pseudo-mad mannerisms. ‘Look Mummy No Hands’ by Dilly Keane offered O’Sullivan a excellent chance to display her considerable ability to move an audience, with its lyrics about youthful regret, as reflected on later in life, with its refrain of ‘How careless we are when we’re young’, beautifully interpreted by O’Sullivan for her rapt listeners, many of whom had tears in their eyes at the end of her beautiful interpretation of this heartfelt song. Which, presents an opportune moment to praise the versatile, stellar band, as the multi-layered ‘Three Penny Opera’/Music Hall feel created for this song was a credit to both their talents and the variegated moods of the song itself as well as O’Sullivan’s definitive performance of it. But the musicians admirably rose to the occasion on each and every number, often providing capable back-up singing as well, adding their invaluable input to the show’s effective closing. If it sounds like I’m citing nearly every performance in this concert as definitive, it’s because that’s what they are! And, O’Sullivan’s interpretations of Nick Cave classics such as ‘God is in the House’ and ‘Ship Song’ could easily be added in among the highlights, along with Kirsty McColl’s comically endearing, ‘In These Shoes’, and O’Sullivan’s memorable performance of ‘Hurt’ by Nine Inch Nails’ Trent Reznor. Though it doesn’t matter whether you are already familiar with these songs or not, as the versatile, good-natured, gifted and giving Camille O’Sullivan is bound to keep you captivated with her wonderfully expressive performances of them. There is also a cinematic feel to the show’s production with each song framed in its own singular moments in time, as the closing words of each fade into darkness preceding the next seminal number. Alex Adamson’s sensitive lighting design manages to capture and retain the shifting moods of O’Sullivan’s song selections, heightening the drama and/or lightening the moods as needed to the point where his pivotal work is more appreciated in hindsight than in the moment, allowing O’Sullivan’s performances to effectively, take centre stage. If you’ve never heard of Camille O’Sullivan, you’re bound to be hearing much more of her very soon, especially in light of her past guest appearances in the Olivier Award winning, must see circus cacophony La Clique, or, on telly’s enlightening show Later with Jools Holland and her subsequent stage appearances in conjunction with Holland, who is thankfully, ever on the lookout for talented musicians the listening public needs to be made more aware of. 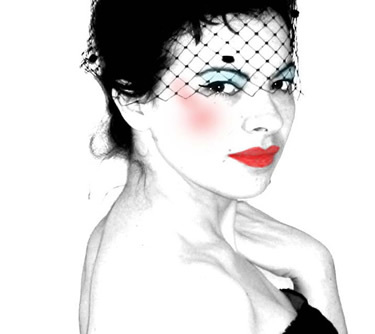 Meanwhile, if you hear Camille O’Sullivan sing, you are sure to become an instant fan, for whether you know her work or not, she is, without doubt, a true star.